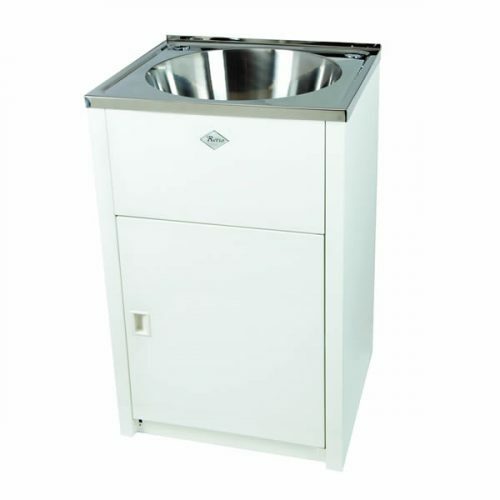 Make the right choice for your laundry with Everhard’s Retro Ice Laundry Cabinet & Sink. 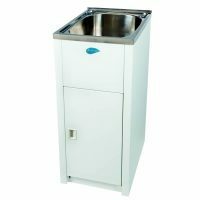 Unlike most other laundry cabinets available in the market, the Retro Ice Laundry Cabinet & Sink features a Dupont® Coating, which makes it incredibly attractive, long lasting and easy to clean. Available in a white finish, this is an elegant laundry cabinet and sink combo that will certainly do well to complement the interiors of your home. 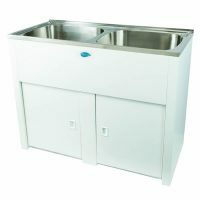 The Retro Ice Laundry Cabinet & Sink measures 560x515x870mm. 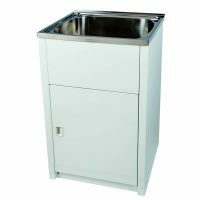 It features an impressive 30 litre stainless steel sink and includes a single bypass assembly as well as a plug and waste. As with all other Everhard products, the quality of the Retro Ice Laundry Cabinet & Sink is sublime. For this reason, Everhard offers a solid 25-year warranty on the metal cabinets and stainless steel sink and a 1-year warranty on all hinges, rods, plug and wastes. It is certainly a fine product that will last you many years, even with substantial usage. One of our bestselling items, the Retro Ice Laundry Cabinet & Sink is currently available at Ross’s Discount Home Centre at an unbelievable bargain. So grab hold of this impressive laundry cabinet today!